Okay, that’s not going to be my whole review, but the joke was too tempting. This is one of those movies that my dad has been trying to get me to watch constantly, and now thanks to Film Studies, I’ve finally seen all the glory that this gem from the 60’s has to offer. Benjamin Braddock (Dustin Hoffman) is a college graduate who has no idea what he wants to do with his life. Things seem to change when a friend of his mothers, Mrs. Robinson (Anne Bancroft) starts seducing Ben. [isn’t she?] He resists at first, but after a while he gives in and the two have an affair. Things are going fine until Mrs. Robinson’s daughter Elaine (Katherine Ross) comes into town. And despite trying his hardest not to fall in love, he ends up doing so anyway. For those of you who have seen the movie and don’t understand why it’s so perfect, I think this video sums it up nicely. But for those who haven’t seen the film, let me simply say that this film spoke to me. Both Benjamin and Elaine are trying to be independent by doing what their parents won’t let them do, without ever questioning if it’s what they want to do either. As a seventeen year old, I’ve felt my rebellious nature develop in a similar way to Ben’s. The symbolism in the film, while obvious at times, really speak to the loneliness of the characters. Everybody has a purpose that need to be fulfilled at the start of the film, and by the end, we’re still not sure who got their wish and who didn’t. To state the obvious, the film’s direction, screenplay, editing, and cast ensemble are all brilliant. Hoffman and Bancroft truly earn their nominations, and Katherine Ross plays her part very well. In the end, The Graduate is a film that everyone should see at some point in their lives, and I’m so happy I got to see this. Yes, I remember this movie. It received great reviews when it came out. 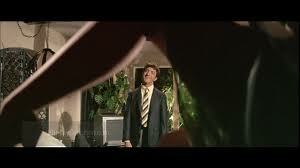 Connor, The Graduate was the first movie I remember really sticking in my mind. It’s in my top five all-time picks even if it seems outdated now. I watched the video clip you included in your review, and for the first time saw what the critic was referring to about the bus ride. I’d never looked at it that way before. However, why can it not be that they don’t necessarily have to stay together, but at least he “rescued” her from another marriage that wasn’t meant to be? That’s what I’ll now take away from it. Love your writing – your first grade teacher!